Things started off well for the newly minted Huntersville Board on Monday night with the unanimous selection of Commissioner Melinda Bales to serve as Mayor Pro Tem. Bales received by far the most votes in the election for the Huntersville Board being the only candidate to break 3000 ballots. As tradition has it she became the Mayor Pro Tem serving as Mayor Swain’s “backup” even though there are other commissioners with longer tenures on the Board. Things quickly turned south after that. 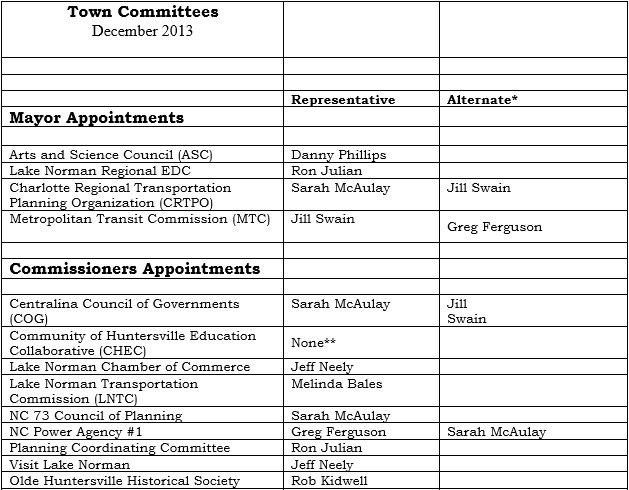 The second vote for the new Board ended in a tie when Mayor Swain put forth a recommended set of committee appointments that clearly stacked the deck with commissioners from “Team Swain” (Ron Julian, Sarah McAulay, and Jeff Neely) receiving 7 assignments including all of the most important and influential posts. “The Others” on the Board (Melinda Bales, Danny Phillps, and Rob Kidwell) received a combined total of 3 spots. When it came time to vote on the assignments “Team Swain” and “The Others” split 3-3 with Mayor Swain casting the tiebreaker in favor of her picks. See below for the details. Here are a couple of the low-lights of this set of assignments around the major transportation issues affecting our region. Mayor Pro Tem Bales gets the LNTC post while Sarah McAulay gets sent back to the CRTPO (formerly MUMPO) post. While the LNTC sounds important, thereal transportation decisions for our region are made at the CRTPO. 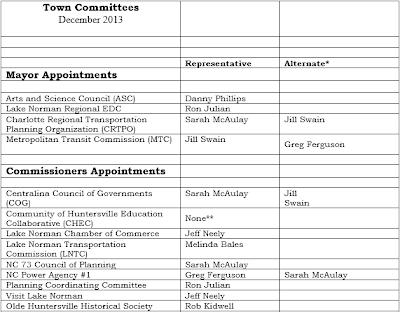 Instead of sending the highest vote getter for Huntersville to CRTPO, Mayor Swain chose to send the person who tried to shut down debate at that group on the all important widening of I-77. See this video where Chairwoman McAulay prevents members of the public from speaking at the public hearing on widening I-77. Ad Exposes Governor McCrory's Very Own "Den of Thieves"
How Close Does Cintra's Road Get To Governor Pat McCrory?